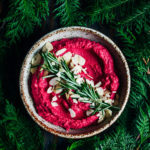 Bright, vibrant Vegan Beet Hummus! Okay, well it was snowing a couple of minutes ago, but as I’m writing this it seems to have stopped. Still, I’ll take what I can get. We’ve had a decidedly green winter so far this year, and I’ve been dying for a little snow. 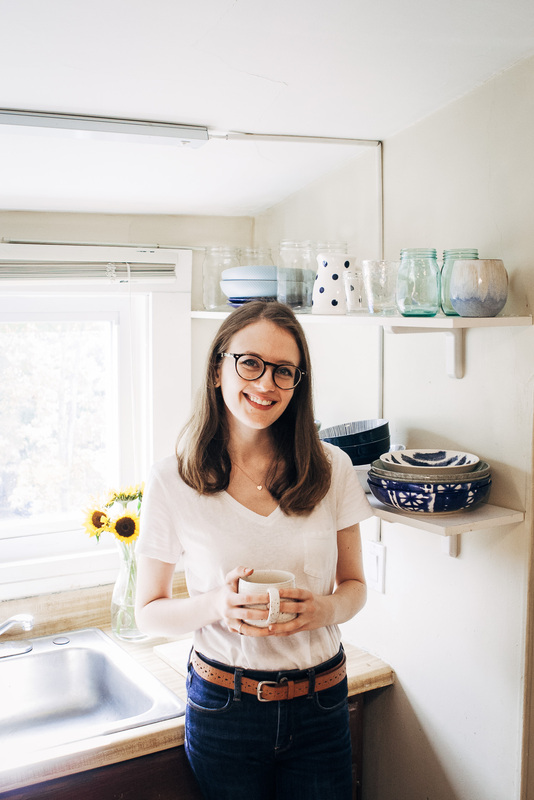 I’ve also been reading picturesque accounts of snow from other bloggers (Molly and Melissa’s recent posts come to mind), which isn’t helping my snow-jealousy. So if you’re getting big storms of crystallized water where you are, send a little my way, okay? Also, while we’re here, I wanted to take this time and give a shout-out to my best friend (who you may have seen in my Nomcasts here and there) for being SO AMAZING at his band’s show last night. 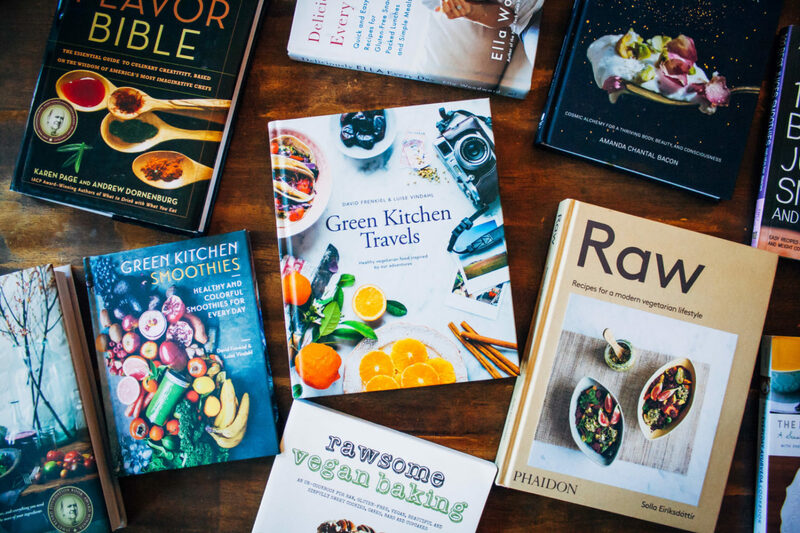 Also, PSA to all of you – SUPPORT YOUR LOCAL ARTIST / MUSICIAN / COOKBOOK AUTHOR!!! Why? 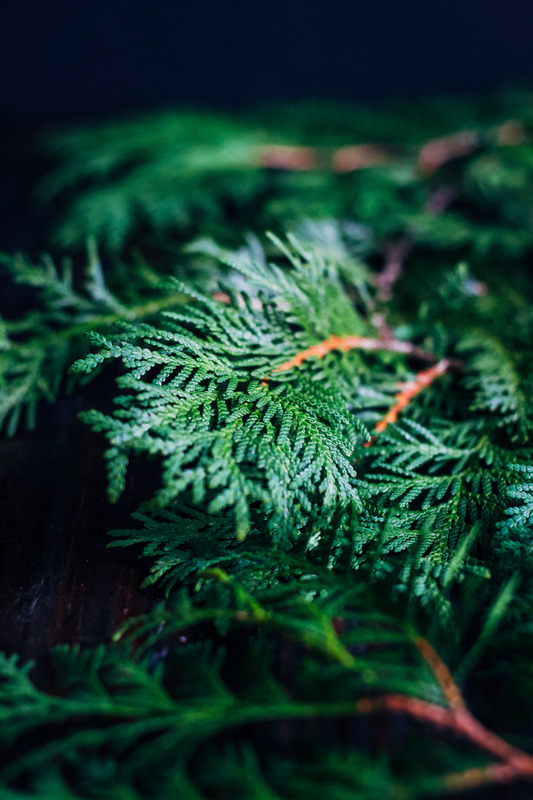 Because they are adding beauty to a world that is so often pervaded with negativity. 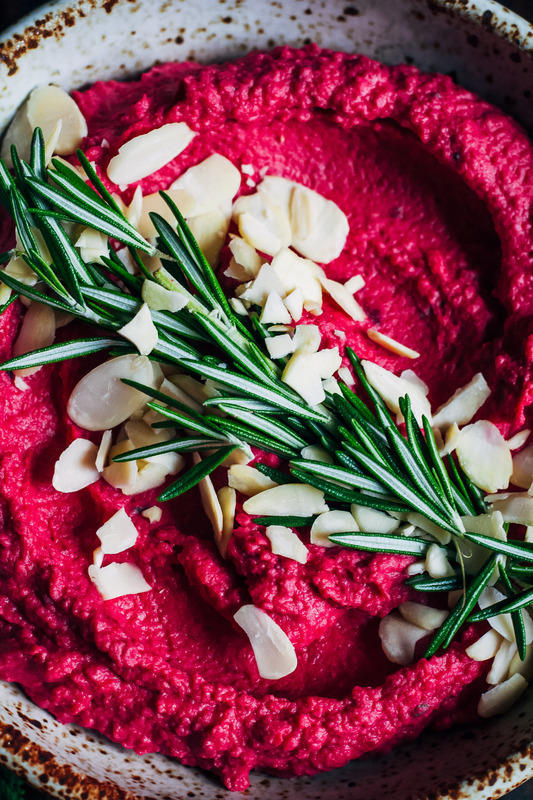 This vegan beet hummus is as healthy as it is beautiful, with earthy red beets, roasted garlic, and fresh rosemary. When done, take out of the oven and let cool. Once garlic cloves have cooled down a little, add them to your food processor BY THEMSELVES and process on their own - it will do the mincing for you. 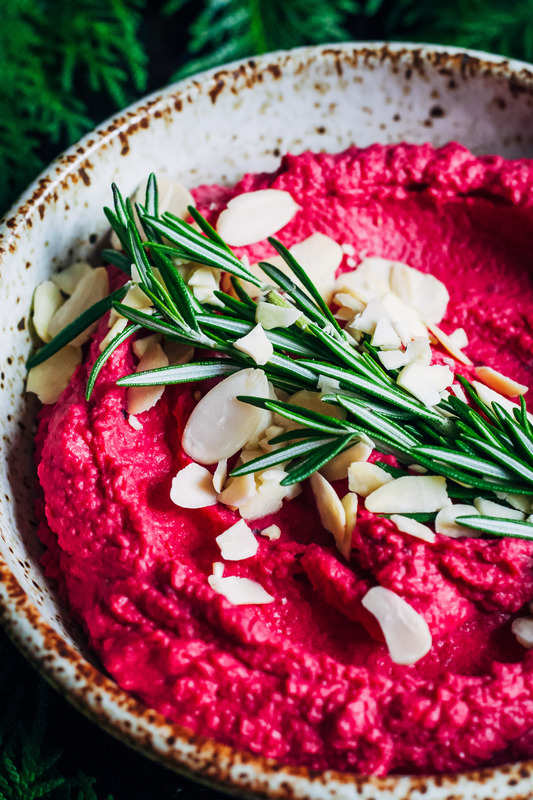 Then add beets, chickpeas, and all other ingredients, and process on high until hummus has reached the desired consistency. When done, scoop hummus into a bowl and garnish with fresh rosemary and almonds, if desired. I can’t get over the color of this hummus – it’s so FABULOUS! And it makes me happy just looking at it! We haven’t had much snow here either. I could use a little for a bit of Christmas magic. I hope it comes next week! THESE PHOTOS!!!! absolutely stunning, love love love this. Hooray for snow! I so hope it returns! 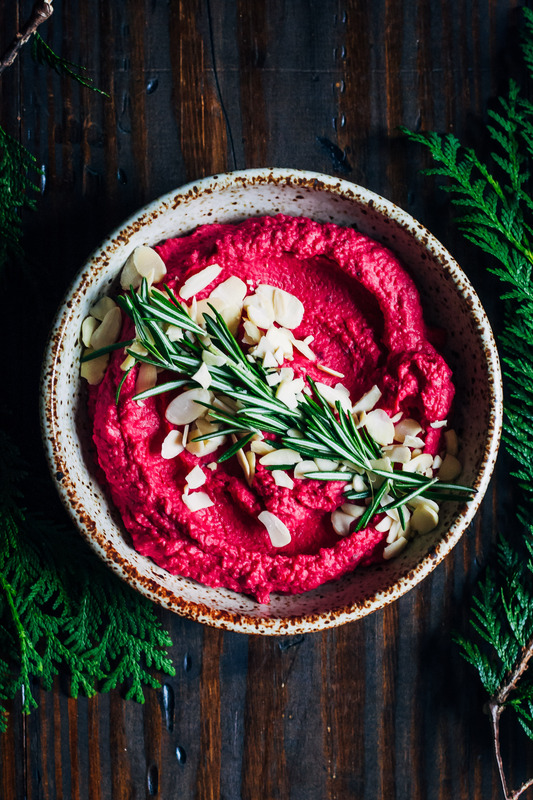 We had our first last week, but it melted within hours :/ This hummus is sublime… and beet hummus makes a festive hummus this time of year! I love it! And yes to creating something that isn’t a cookie – OMG – I’ve eaten way too many! I’m on a cookie detox through the new year! haha! Beautiful cedar too.. I love it’s fragrance and the trees are essential for bringing shelter and food to wildlife. Delicious work my dear! So jealous of your snow day! It never usually snows until around February over here, which makes a white Christmas very unlikely :-( Anyway, the colour of this hummus has totally just lifted my mood. And it sounds SO good. I’m obsessed with hummus. This hummus is stunningly beautiful. I love the way you contrasted the pink color with the green. Gorgeous!! That color on that hummus looks INCREDIBLE! Love these beautiful photos and can’t wait to try the recipe!!! Oooh, these photos are making me want to whip out some beets and get to making some. Absolutely beautiful. I also don’t think I’ve ever tried adding rosemary to my hummus. Now that I think about it, it sounds totally yummy. Yesyesyesyesyes!!! Love beets and love hummus and I’ve been looking for a good beet hummus recipe!! Kismet! Thanks for sharing! Your pics are gorgeous! I love beets! This looks amazing. That color though :) Your photos are all so stunning!